Summers usually mean long balmy days, picnics and barbecues with friends and family and very often, just packing up for a couple of days and lazing around at a country retreat. Living the dream. The house we are looking at today is a stunning little summerhouse with a unique design, one that pays great attention to detail while only occupying a space of 60 square metres. Did we mention that it's situated at the edge of a forest and is flanked by a quiet little lake? It's a true getaway, if there ever was one. The versatile prefabricated wooden house is a collaborative effort between the Germany-based Patrick Frey and Björn Götte. 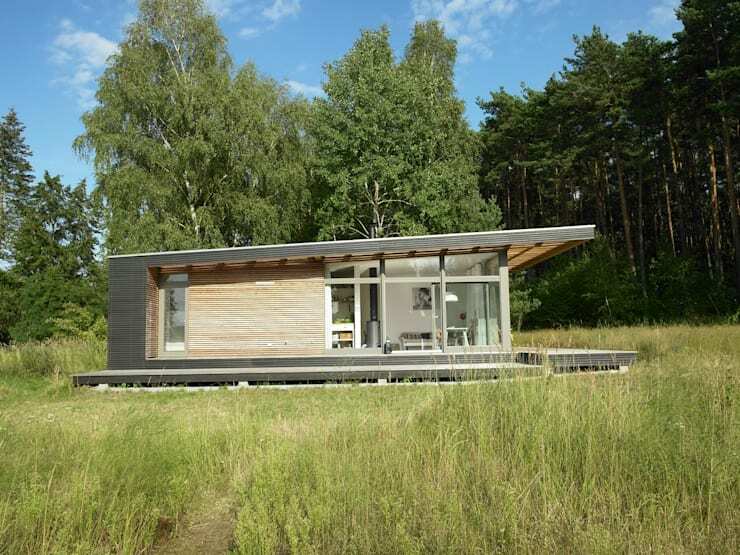 The architects have created an eco-friendly Scandinavian home—Sommerhaus Piu—that can be used year-round (thanks to its high thermal insulation) and redefines comfort. Whether you're planning to spend a summer away at a retreat like this, or want to own one of your own, this gorgeous summer house is a surefire way to be inspired! The lovechild of a futuristic urban dwelling and a rustic wooden cabin, Sommerhaus Piu is characterised by clean, simple lines, open spaces and versatile floor plans. All while being nicely ensconced in the middle of those beautiful natural surroundings. Thin horizontal strips of wood make up the facade while the slightly inclined roof is edged with charcoal planks. 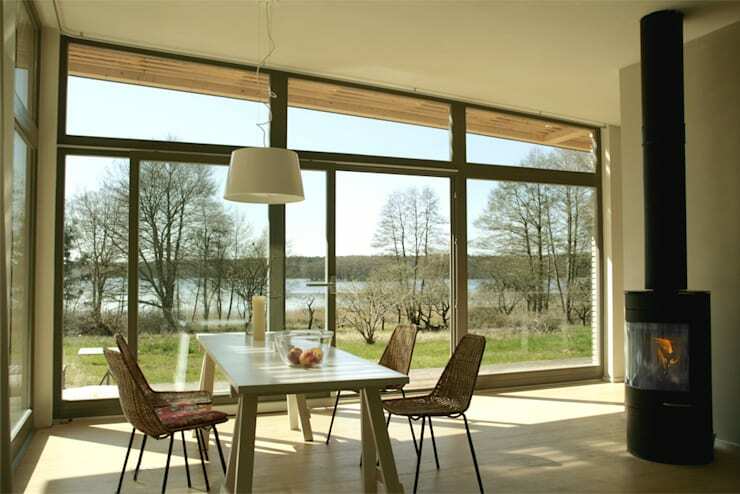 The energy-efficient clerestory windows allow natural light to flood in and keeps the space cool and breezy. We're pretty much ready to pack our bags and leave for this sanctuary for a couple of days (or months!). Check out that dining space that oh-so-casually overlooks the lake. No need for any additional furniture or accessories to jazz up this area. A simple log burner ensures that on a cool summer night, residents can bundle up inside and stay cosy, all the while being able to enjoy that view, thanks to those floor-to-ceiling windows and doors. It's a great way to blur the boundaries between communal spaces and nature. If you want to know more about clerestory windows, speak to our experts; they'll guide you along. Apart from the dining space, the Sommerhaus Piu houses a moderately-sized kitchen (because let's admit it, you're not going to cook up a storm every day when on holiday) and a bedroom. 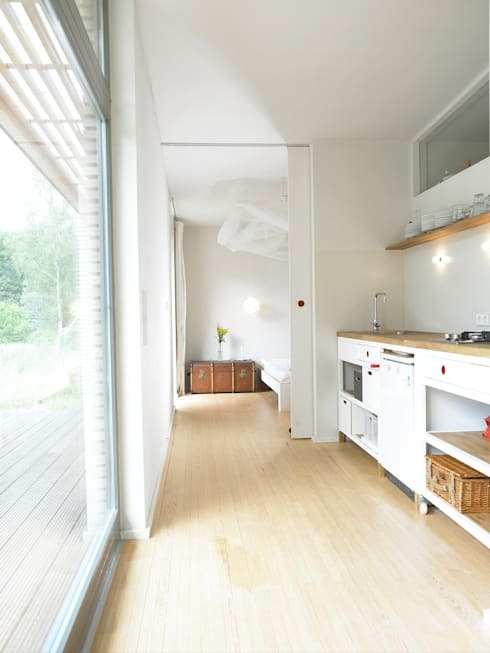 The kitchen is a bright, cheery space owing to the large glass windows on one side and the pure white cabinetry. The kitchen is connected to the bedroom although the two spaces can be easily separated via a discreet sliding door. The bedroom too is done up sparsely yet thoughtfully; a vintage chest for example makes an appearance adding more warmth and character to the space. Another detail: the bedroom has limited windows so that it is protected from direct sunlight. What sort of summerhouse would it be if it didn't have a deck outside? Sommerhaus Piu takes it one step further, and wraps the entire perimeter of the house with a covered veranda. Here, you see how the kitchen doors open out onto a terrace so that residents can dine outside or simply chill and take in the surroundings. The extended veranda also ensures that the house is protected from the elements, which could erode the quality of the wood. We leave you with this whimsical image of the Sommerhaus Piu overlooking the lake. You can see here how the architects have built the house on a slightly raised platform so that the timber doesn't come in contact with the soil. Now, simply imagine sitting on the terrace (or cozied up inside) and having a panoramic view of the area! If you can't afford to go on a summer retreat at the moment, but want to bring it home to you, here are 9 simple ways to make your home an oasis. 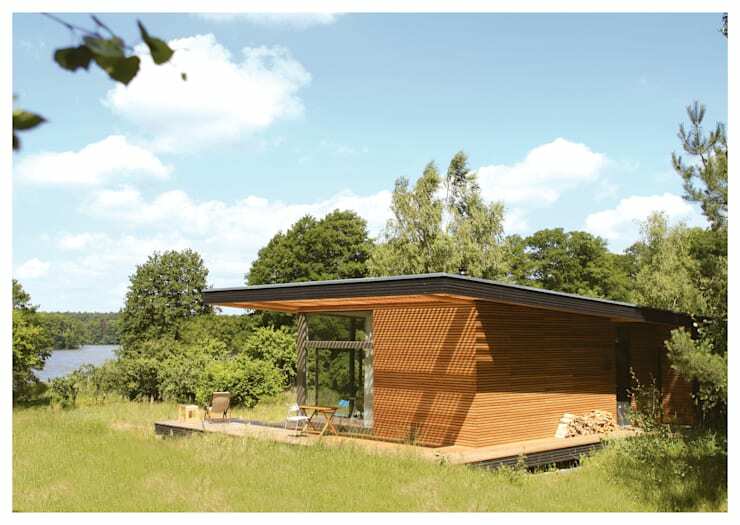 What did you think of this eco-friendly haven? Let us know in the comments below!